Last week we visited the Iziko South African National Gallery with friends to see the wonderful '1910-2010 From Pierneef to Gugulective' exhibition. 100 Years worth of art depicting our South Africa's history, our present, our issues, our pride and our shame. The works by Jane Alexander, Willie Bester, Brett Murray, Mary Sibande captured my imagination, and moved me as they always do, as did the old Drum magazine images by photographers such as Jurgen Schadeberg. 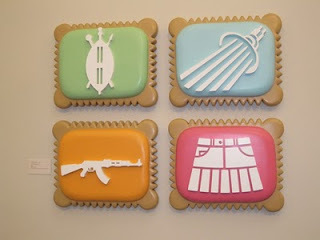 But the one that reminded me just how far we've come as a nation was the work Zuma Biscuits by Stuart Bird. 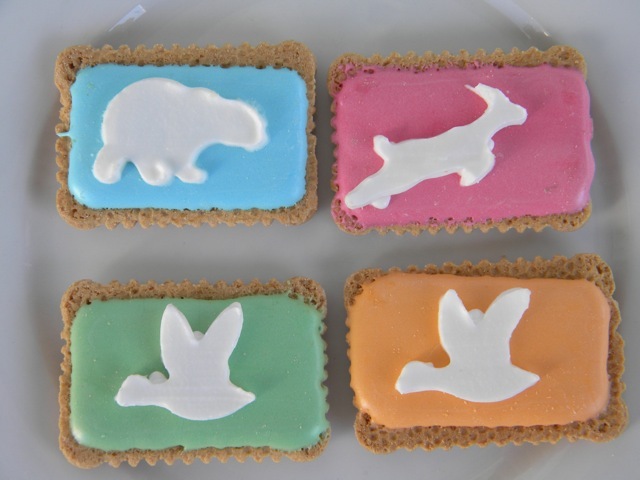 Using as inspiration the Baker's Zoo biscuits which South Africans (admittedly not all) would remember eating as special treats during their childhood, he tackled the thorny issues regarding President Jacob Zuma. The innocent images of animals were replaced by the more emotionally-laden and politically-charged images of a Zulu shield, a shower head, a machine gun and a mini skirt. So what initially strikes you as a playful, colourful work, upon closer inspection poses some powerful, worrying questions. But what impressed me more than the actual work was its presence in SANG, and that there was a teacher leading some school children in healthy debate about the work and it's symbolism. In much the same way that I had seen the French teacher do in Paris, when I was hung up on all things French and perceived what we had back home as inferior in so many ways. Whether or not one agrees with the sentiments of the the work is, for me, less important than the fact that it exists; that it hangs in our National Gallery and and that our schoolchildren are exposed to it. And of course, it got me thinking when last I'd eaten a Zoo Biscuit. We never ate them in our home, but Granny Dulcie used to buy them for us for when we went to visit her and Grandpa for tea. They were a very special treat. I loved the pastel colours, the pictures, the taste of the sweet grainy icing before the biscuit base balanced out the sweetness. I liked the crunch factor, and was never one of those children who licked off the white icing animal first. To be honest I was rather repulsed by the actions of those who did. I nibbled it starting at one corner and when I got halfway through, I took one large big bite, liking the way the sweet icing and biscuit filled my mouth. So afterward the exhibition I bought a packet and ate Zoo Biscuits for the first time in 30 years. And it brought back happy memories of Gran and Grandpa and their nesting wooden tables, and the tiny table that had a key underneath it, and when you would it up, played a pretty tune. And drinking tea out of pretty cups and saucers, and chocolate squares that were kept in the fridge. And the memories were as sweet as the icing sugar that melted in my mouth. And yes, the pictures on the biscuits don't seem as clear as they did when I was a child. But then they seldom are. And while things may not always be clear or as pretty as you would like them to be, I found comfort in the fact that these biscuits were a South African thing. In the same way that Bird's work was. And being South African , for me anyway, is always both sweet and disconcerting. I used to eat my Zoo Biscuits with a glass of milk, perfect for an abbreviated dunk so that the icing is cold and the biscuit is still crisp. Think a visit to the 7/11 is in order!